Sennheiser HD800 review | What Hi-Fi? 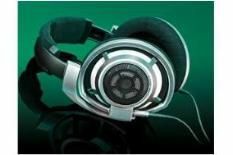 The Sennheiser HD800 headphones are a very different proposition from other headphones in this price bracket. They look quite conventional at first glance, but these are very far from being ordinary ‘cans'. For starters, they use Sennheiser's most advanced driver technology, a larger-than-usual 56mm diaphragm and a stainless-steel transducer. They're also unusual in that they work by directing the sound into your ear at an angle – more like listening to a pair of speakers in a room, in other words. The HD800s are designed for performance above all else. And they should be approached carefully if you have any need whatsoever to keep your musical enjoyment private (and thereby not annoy the family). Although the open-backed Sennheisers don't leak sound into the room with quite the abandon of some cans we could name, there's still enough spillage to cause an argument if a loved one is in the same room trying to read the latest ‘vampire romance' novel or whatever it is they read these days. And let's face it, when music sounds this good, you won't really want to turn it down. The HD800s sound really quite sublime. Bass kicks hard and deep, while there is intense precision and detail on offer. A languid hour of Beethoven String Quartets with these on your head is as good a way to waste time as we'd admit to knowing. Likewise, the punchy, raucous and ragged glory that is Neil Young's live Weld album is equally well-represented, with an admirably pristine way with tonal clarity and rhythmic organisation. They're comfortable on the ears, too. The big ear cups will fit just about anyone (unless you managed to land a small role in Star Trek without the use of make-up), and they're very likeable to use, even over very long listening sessions. The only thing that counts against the HD800s is that for all their precise clarity, they don't muster the astonishing levels of instrumental realism that rivals such as the Grado GS1000i manage. As great as these Sennheisers are, the Grados have an authenticity and openness that makes the HD800s sound, comparatively, slightly sterile. Make no mistake, though – these are terrific headphones. And are definitely worth a listen.